I love this stuff. I have super fair skin and most concealers are much too yellow or pink or dark for me, but this one is perfect. It gives me solid coverage. I put a little bit of powder on top of it and it doesn't budge. Ok, yeah, I know I'm a guy, but since I run acne.org sometimes I need to have a secret back pocket weapon just in case I happen to get an imperfection of some kind and need to go to a big important meeting or be on camera or something. 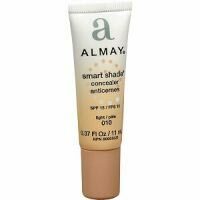 Luckily I rarely break out, and if I know something important is coming up, I'll use glycolic acid in the days leading up to the event to ensure perfect skin, but for extra insurance, I have a tube of this Almay concealer around. I've had it for many years and will basically never run out of it. I just unscrew the cap and touch the point to my skin if I need a little concealer. It's a small investment that has been nice to have around in rare instances. And zero times ever has anyone ever suspected I'm wearing makeup. I can get away with the light or medium shade, either one.